Bring some elegance and class to your tea making ritual with these minimalist Chinese bamboo tea trays. 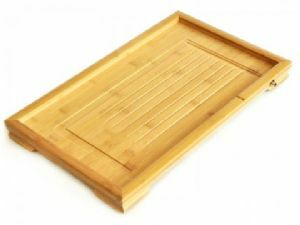 With style and utility these beautiful trays are designed to create a portable tea station catching any spilled water or leaves when making your tea. Essential for more involved tea making such as gong-fu cha and other tea making practices where temperature control of all teaware is important. Manufactured to a high standard with non-slip feet and easy cleaning matt gloss finish, these look stunning in any tea setup! Small: Approximately 36cm by 24cm and 4.5cm high. Weighs 1Kg. Large: Approximately 48cm by 29cm and 4.5cm high. Weighs 1.5Kg. Both come boxed in original Chinese kraft box packaging.